While most kids were playing with action figures, Eric was in the kitchen testing and tasting recipes. As a youngster growing up in Brooklyn, New York, Eric found excitement, challenges and passion in his favorite place—the kitchen. His childhood love became his career path and purpose. He studied at The Culinary Institute of America in Hyde Park, New York and soon after graduation, worked under celebrity chef David Burke at the River Café. He credits this experience with sparking his creative artistry with food. Chef Eric believes that food speaks a universal language. To become a truly accomplished chef, one must be aware of the styles from other cultures. At a young age Chef eric had the opportunity to work with chefs from France, Italy and Japan as he learned how to meld old-world practices with modern techniques. The James Beard Foundation, world famous for re-establishing the American way of cooking and the technique of using only fresh, indigenous ingredients, recognized Chef Eric for his contributions to the gastronomic culinary scene in the United States was was also invited 6x to host a dinners at the James Beard House in New York, the first internationally recognized catering chef to be given this prestigious opportunity. The superlatives continued when The International Chef's Association named Chef Eric Creative Caterer of the Year and Chef of the Year—the only American chef to receive that distinction. Complimenting the industry recognition was the tremendous media attention Chef Eric has received. He's been twice featured in Wine Spectator Magazine with an Award of Excellence. USA Today recognized him as one of the Top Ten New Chefs and The New York Times honored his restaurant, Pleiades, with a three-star rating. Food Art Magazine named Chef Eric one of the Top Ten Chefs. He was featured in Jezebel Magazine in the Top Twenty Chefs of Distinction. Catering Magazine, Catersource Magazine and Chef Magazine all recognized him for his creative small plate creations and trend setting approach. He has made numerous network appearances across Kelly Live, NBC, ABC, Fox5, and The Food Network where he became the 2011 Champion of Chopped, the network's highest rated show and also appeared on Beat Bobby Flay His first cookbook, Stick It, Spoon It, Put It in a Glass, fast became a culinary "must" for caterers, restaurateurs and home chefs alike, as did his newest cookbook SMALL BITES BIG FLAVORS has become for home cooks of all capabilities. 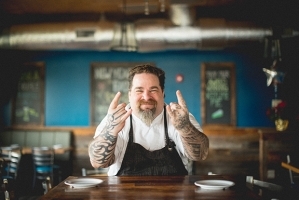 Chef Eric is Chef/Partner at Mr Crabbys Craft Kitchen + Bar and Epic Ideas. Chef Eric has received the Restaurant Guild International Chef of the Year 2013/ 2015. In addition to all of Chef Eric's culinary accolades Chef Eric pays it forward to many charities and has been awarded with The 2016 VISIONARY LEADERSHIP AWARD by the Housing Partnership for his impact and leadership in the local and national community helping others. Recipient of the Restaurant Guild International, Career Achievement Award 2018.